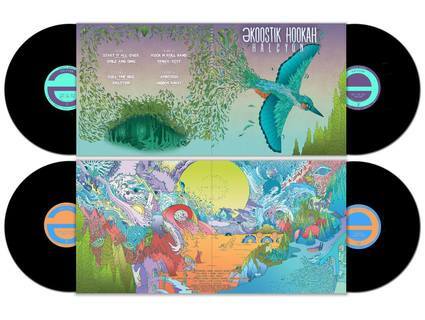 ekoostik hookah is excited to announce their first release on vinyl, ‘Halcyon’. The limited edition 2 LP set is scheduled to ship in Spring 2018. Combining modern production techniques with the classic feel of a 1970’s concept album, ‘Halcyon’ ventures into the mystical through the lens of modern explorational rock. Recorded in 2017 at Capital University, ‘Halcyon’ was produced by ekoostik hookah and Robert Rutherford. Guitarist Eric Sargent took an active role in mixing the project, and original ekoostik hookah percussionist Don Safranek plays as well. The result is a quintessential “hookah” sound which fans are certain to enjoy.